There are a lot of different way to make a western film. There’s the more traditional ways that are often equated with actors like John Wayne and there’s also more modern and/or revisionist westerns that have been made by film makers like Sam Peckinpah, Quentin Tarantino, and Clint Eastwood. My personal favorite kind of westerns, however, are the Italian made spaghetti westerns. I like to compare spaghetti westerns to comic books since they’re usually colorful (with setting and characters), over the top, and often violent. The most famous of these films arguably make up Sergio Leone’s Dollars Trilogy, which are A Fistful of Dollars, For a Few Dollars More, and The Good, the Bad, and the Ugly. Not only did these films help launch the careers of Leone and Clint Eastwood to new heights, but also plenty of other reasons that make these films classics and worth a review. 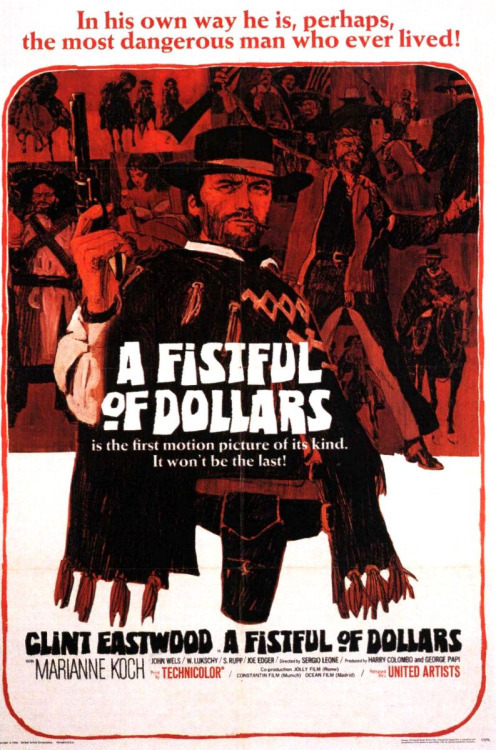 Let’s start with A Fistful of Dollars from 1964. In this film we are introduced to the now iconic character, the Man With No Name (Clint Eastwood), a wandering gunslinger who happens upon a small Mexican border town called San Miguel. What the Man finds in this town is surprising. San Miguel is a town that is under the clutches of two rival gangs. One one side there’s the Rojo family, who deal in liquor, and on the other side is the Baxter family, who deal in weapons. The mysterious gunslinger realizes a way where he can make a profit from both sides by playing each family against each other. While this is a great source of income, the Man learns by the local innkeeper, Silvanito (José Calvo), of the great stress that the two warring families have put on the town and the lives that have been lost in the process. This turns the Man’s mission of profit into a mission of protection and vengeance for the townspeople. If you’re thinking that the plot for this movie is almost the same exact plot for Akira Kurosawa’s 1961 samurai film Yojimbo, you wouldn’t be the only one. The fact that this film was an unofficial remake to Yojimbo, without giving credit to that film as inspiration stirred up some controversy when it was released. To be fair though, Yojimbo was pretty much lifted from Dashiell Hammet’s 1929 novel Red Harvest. While A Fistful of Dollars seems to be taken from a couple different sources, the film still stands as a film that helped redefine the western genre. 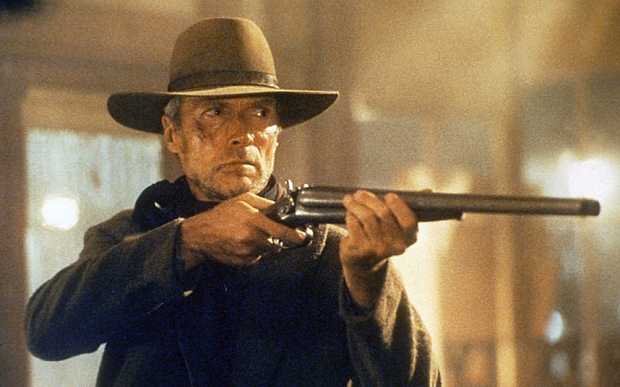 Clint Eastwood’s performance as the Man With No Name is one of the most iconic in film history. It’s been imitated and parodied, but never has it been equaled. Not only is the Man a real tough guy and quick to shoot, he also shows a lot of compassion and has a great sense of humor. It’s really everything you look for in an archetypal hero like this. Sergio Leone’s direction also elevates this movie above many others in the genre because of the abundance of style thrown into it. Not only does it have western tricks and motifs, but also implements Eastern styles of film making like using close ups and quick zooms. Finally, this movie really wouldn’t be complete without Ennio Morricone’s controlled and melodic score. So, in conclusion, A Fistful of Dollars stands tall as a classic of the western genre, but this review doesn’t stop there. 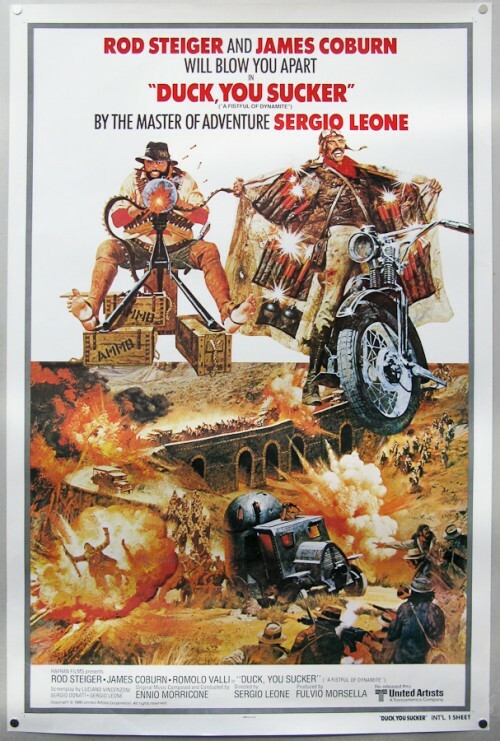 After being pressured by the studios, Leone would go on to make a sequel, For a Few Dollars More released in 1965 overseas and in 1967 in America. Not only is this a great sequel, it’s a huge improvement over the first film. The wild west was the land of bounty hunters, and the people that matched the hunters in dangers were only the people that were being hunted. Problems also tended to arise when two bounty hunters vied for the same target, which is the case of the $10,000 reward on El Indio’s (Gian Maria Volonté) head. 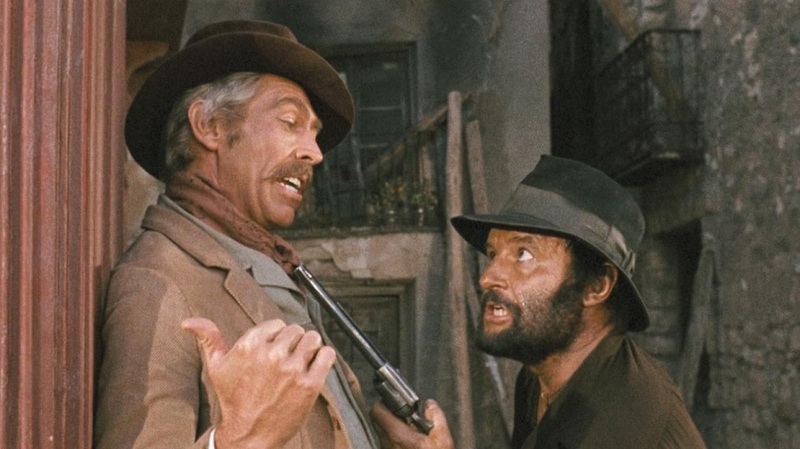 On one side there’s Col. Douglas Mortimer (Lee Van Cleef), an ex-soldier who was labeled the “finest shot in the Carolinas.” On the other side is the Man With No Name, aka Monco, a wandering gunslinger who can draw faster than you can blink. When the two bounty hunters wind up in the same town, it becomes quite clear that they would be more effective if they teamed up to take down El Indio and collect the enormous bounty on him and his gang. 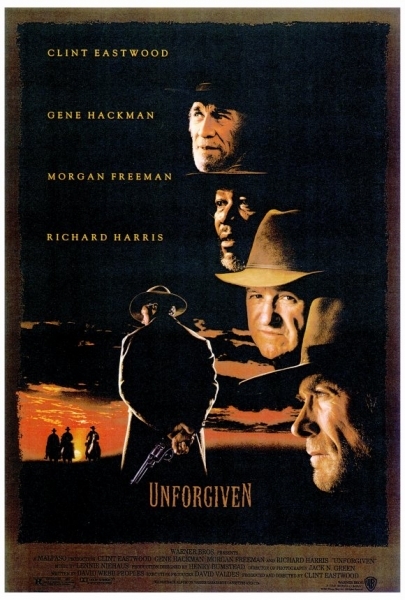 This is a movie to get really excited about because you have to think about how cool A Fistful of Dollars was and add a bigger story with more larger than life characters and then you finally get For a Few Dollars More. 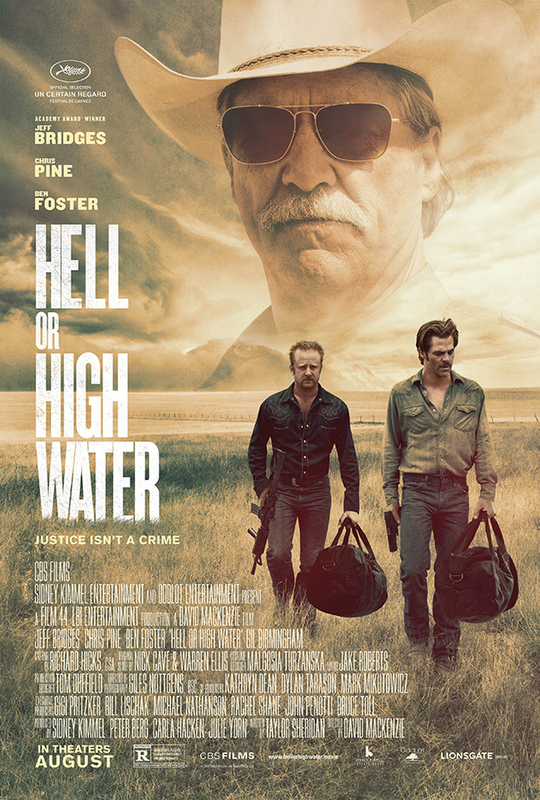 This film perfectly builds on my describing spaghetti westerns as the comic books of the western genre. Monco and Col. Mortimer feel like superheroes the way they can hit their targets from so far away. Even the way they dress is symbolic to their characters. El Indio on the other hand is a perfect super villain since he can shoot almost as well as the two heroes and has a gang of henchmen surrounding him. Not to mention his over the top personality. This film is just a super entertaining and well made movie. Ennio Morricone returns as composer for the film and the music is also a huge step forward. One song in particular is written and performed like something you would hear in a music box. That kind of composition reminds me of Morricone’s work for The Untouchables. This film is also the point where Leone found out just how skilled he was as a film maker and also strengthened his stylistic choices. Leone is known for his sound and editing, and there are many scenes in For a Few Dollars More that feature no dialogue, but only some sound or quiet music. This trademark would be perfected in the opening scene of Once Upon a Time in the West. While A Fistful of Dollars is arguably one of the best westerns ever made, it can be debated that For a Few Dollars More may be one of the best films ever made. Believe it or not, things only get better with the third film of the trilogy. This is of course the 1966 film The Good, the Bad, and the Ugly, which has become one of the most iconic films in the history of cinema. As the American Civil War ravaged the entire country, there were many people who did anything they had to to survive. Tuco (Eli Wallach) is a bandit on the run from law enforcement and bounty hunters that seem to be coming from every direction. Angel Eyes (Lee Van Cleef) is a ruthless bounty hunter who will kill anyone of any age in order to complete his job and get paid. Finally, there’s the Man With No Name , aka Blondie, another bounty hunter, who along with his new partner Tuco, scam towns by collecting reward money and then escaping later on. As Tuco’s and Blondie’s partnership collapses, another monkey wrench is thrown into their lives: a rumor of hidden gold buried in cemetery. 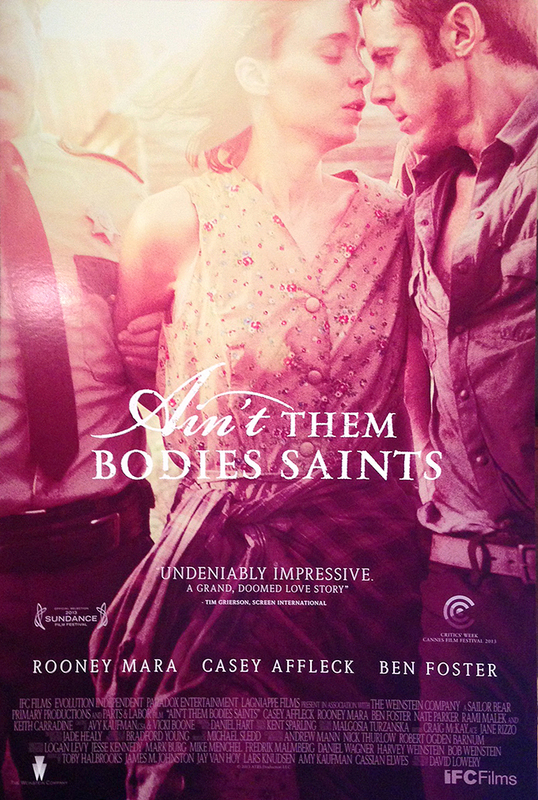 Blondie knows the grave and Tuco knows the cemetery, forcing them to once again work together. Unfortunately for both of them, the sadistic Angel Eyes also wants a piece of the gold and will stop at nothing to claim it all for himself. 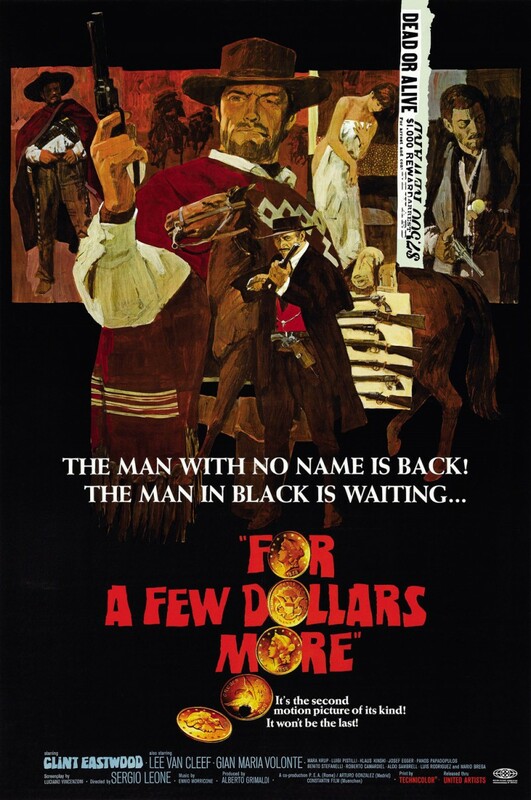 While it can be argued that For a Few Dollars More is one of the greatest films ever made, I’m pretty sure that anyone who has scene The Good, the Bad, and the Ugly will agree that this is definitely one of the best movies ever made. Everything that I’ve said was great about the first two films are back for this one, but enhanced on such an epic scale. There are so many iconic moments that it’s hard to name them all. The destruction of a bridge strategically placed in the middle of a major Civil War conflict and the climactic Mexican showdown in the middle of the cemetery are just a few examples. The film’s themes are also as epic as the everything else you see. The catastrophic effects of war and how it shapes people trying to survive through it is a surprising theme for a movie like this, but there are scenes where it really can strike a nerve and get the emotions flowing. When the film was first released in 1966, most critics gave it a lot of negative reviews because they were disgusted by how violent it was. 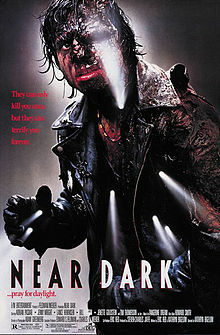 Yeah, it’s violent, but like the other films in this trilogy it happens very fast and always has a reason. 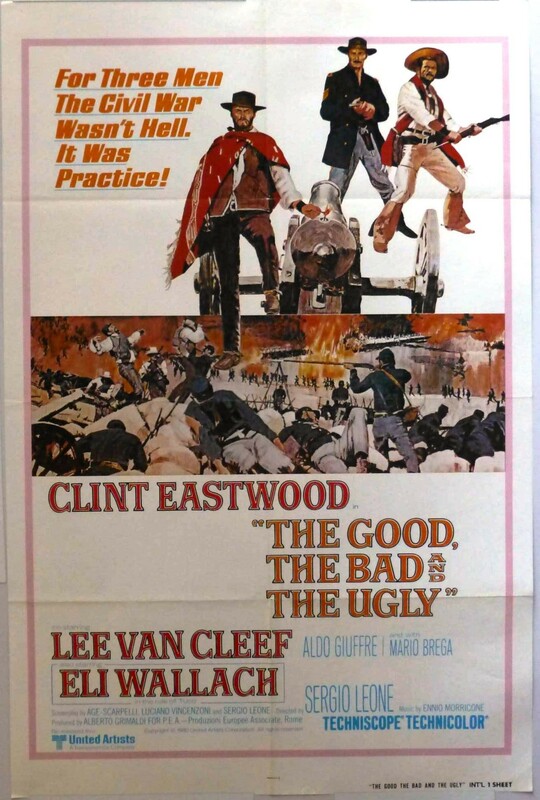 The only thing excessive about The Good, the Bad, and the Ugly is the run time. Granted, I’ve only seen the extended version so I may be a little unfair. 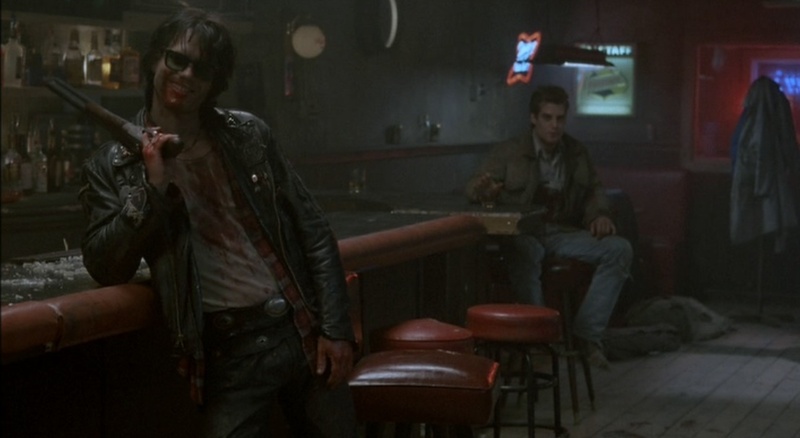 What isn’t unfair is my complaint that Angel Eyes doesn’t get NEARLY enough screen time. This film is also very episodic in nature, but watching the characters adapt to whatever strange scenario happens next actually builds up who they are more than you might expect. Finally, I can’t talk about this film without mentioning how Morricone created one of the most beloved film scores in the history of movies. The Good, the Bad, and the Ugly is a landmark of film making, and must be discussed whenever the topic of film history comes up. It truly is a masterpiece. I could say so much more about the Dollars Trilogy and I might one day. For now, I just wanted to give an overview of it and try to explain why they are three of the most important films you may ever see. 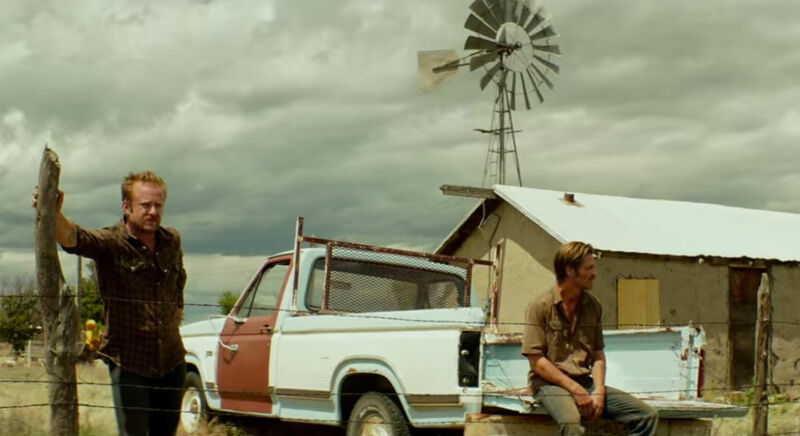 Leone completely deconstructed the western genre and turned it into something never seen before. If you haven’t had the pleasure of seeing these films yet, it must be done as soon as possible.